The bedrock of a country's development rests on the shoulders of Education but it is the otherwise in Ghanaian public schools specifically, basic schools. It is as if those attending public basic schools are not a part of the country's development. With a huge population mainly attended by children of the poor, the quality of education at the basic school is not a matter of concern but a political swing and a garnished tool used by politicians to paint goodwill to the electorate to amass votes and continue to maintain power forgetting the main issues confronting it. 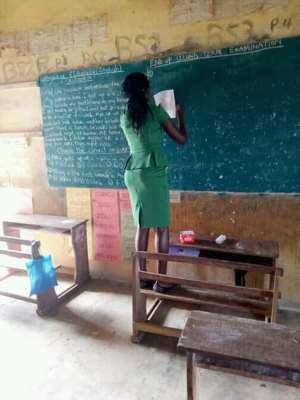 A Facebook post by one Ekow Djan, a columnist and a trained teacher concerning how a young female Ghanaian teacher by name Philomena Woode going through hassle till the extent of climbing a desk to scribble end of second term examination on the chalkboard which was supposed to be a printer's job. 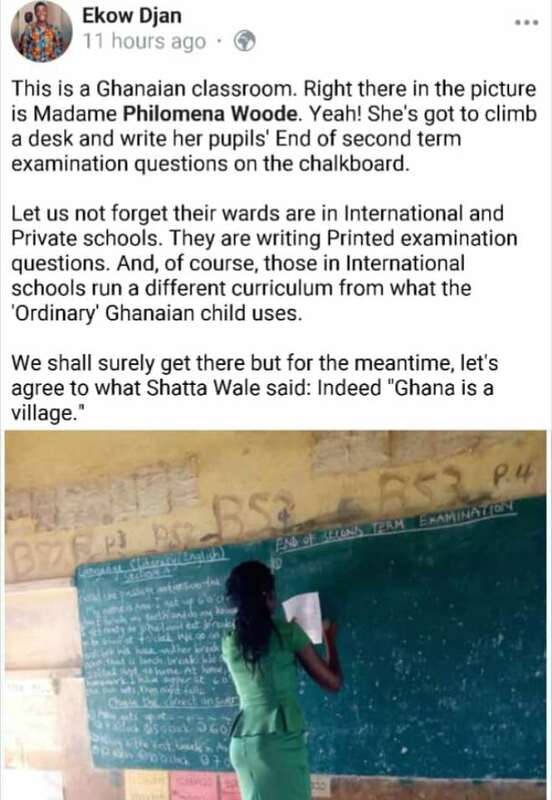 In Djan's post which lauds the lady for his zeal and love for teaching, he criticised the mangers of education in Ghana and revived Shatta Wale's comment saying Ghana is a village.